What can we learn from previous generations so that we stay on track to follow the God of ALL generations? When we try everything but repentance, a mess will follow! Half-way obedience is full disobedience- Pastor Waggoner elaborates..
Pastor Waggoner explains why we must always rely on God’s strength. Pastor Waggoner unpacks what we can learn from King David’s son, Absalom, as he attempts to overthrow his father. Pastor Waggoner teaches us the difference between our supposed enemies and the real enemies! Beware of a hardened heart-what can we learn from Pharaoh to prevent or cure us of having one? 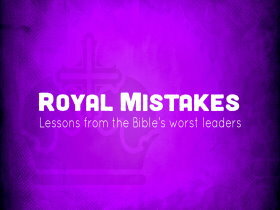 What can we learn from the Royal Mistakes kings and leaders have made? Pastor Waggoner breaks it down for us.